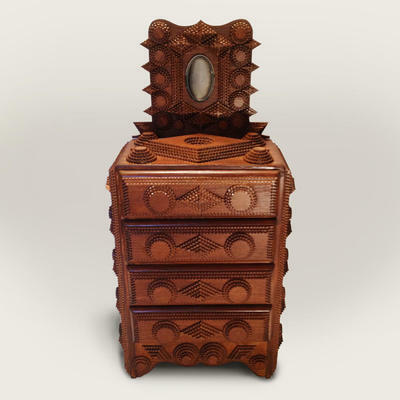 Made from a vintage piece of doll furniture, this piece has a diamond and circle motif. The mirror is detachable and can be easily screwed on and off the dresser. The actual mirror is a vintage "pocket mirror". The back has the original "butter yellow" paint and the interiors of the drawers are painted to match. Approximately 300 hand-cut and carved pieces of wood were used in creating this one-of-a-kind work of art.